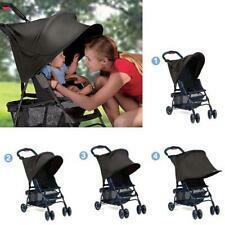 Universal Sun Shade Maker for Kid Baby Strollers Pram Buggy Pushchair and Car Seats. 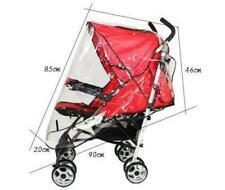 This item can be used for a stroller with basic canopy. TypeSun Shade. This item can be used for any universal car seats. Product Description Universal Rain Cover for Pushchair Pram Baby Stroller Rain Cover With Zip Front Opening Buggy Throw Over Rain Cover PVC Transparent Waterproof Wind Rain Weather Shield Protector The item is a universal transparent rainproof cover, which is made of durable waterproof PVC material, and suitable for most standard size r big size strollers, prams, pushchairs, etc. It can well protect your babyildren from the rain, wind, dust, debris and flying insects. It has holes on side for ventilation, and is easy to use. Material : Net. Due to the light and screen difference, the item's color may be slightly different from the pictures. Color : White. Specification: -- Brand new -- Type: Hooks -- Colors: Black -- Style: Pushchairs -- Feature: Each light with 2 pcs clips & 1pc 3M tape -- Our Buggy Clips allow parents to securely hang a baby change bag, hand bag or shopping bags to the frame of the buggy, freeing up both hands to safely steer the buggy. -- Having the baby change bag suspended at waist height means accessing it quickly is very easy; no need to rummage around in the buggy's under seat storage area. Features: -- Fits 99.9% of all buggies, pushchairs, prams and strollers -- Adjustable Velcro strap attaches clip to buggy frame -- Made from aluminium so very light, yet strong -- The perfect parent accessory to make life easier -- Add or remove bags and items simply and quickly -- Never drop or lose your posses. Footmuff has a warm and Cosy padded lining with 100% Polyester filling. Washing Instructions:Machine washable at 40 degrees. Universal fitting will fit most buggies & pushchairs with a 7-point harness. We will be glad to reply and help you to solve any problem. We will answer or help you to solve the problems as soon as we can. We will be glad to reply and help you to solve any problems. *****UK STOCK,FAST DISPATCH & FAST DELIVERY***** Description: Universal Sun Shade Maker for Kid Baby Strollers Pram Buggy Pushchair and Car Seats 100% Brand New and High Quality! 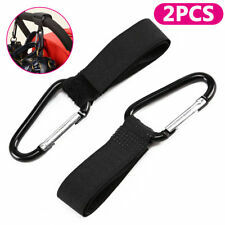 Color: Black Size: 55*75cm/21.65*29.52" This item can be used for any universal car seats. This item can be used for a stroller with basic canopy. 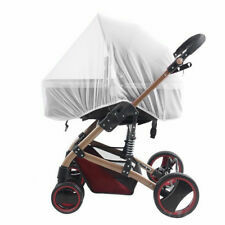 Package included: 1X Sunshade Cover ( Stroller & Car seat NOT included! ). Beautiful Broderie Anglais Universal Pram or Buggy Liner fits most buggies such as Maclaren, Silver Cross, and most other prams and pushchairs. It is a lovely addition to your pram. There are two hole positions for your harness. 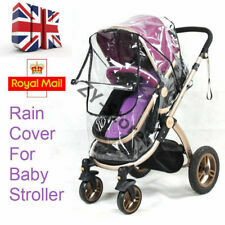 TypeStrollers Raincover. 1x Raincover. Never Leave Your Child Unattended Whilst The Cover Is On Stroller. Once Wet Clean With A Dry Cloth, Keep In Open In Dry Airy Place Until Dry. - Easy Throw Over Design;. Fits most Side-By-Side Double Buggies. Multiple Air Vents for good Ventilation. Will I receive confirmation of my order?. 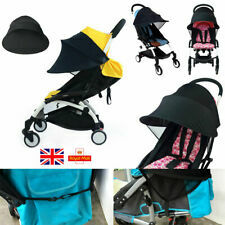 Universal Sun Shade Maker for Kid Baby Strollers Pram Buggy Pushchair and Car Seats. 1x SUNSHADE( Stroller & Car seat NOT included! ). 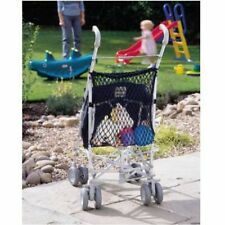 This item can be used for a stroller with basic canopy. TypeSun Shade. Ricaro Carseat, I'coo carseat, Cosatto Carseat, My child carseat, Hauck carseat, Nania Carseat. UNIVERSAL HIGH QUALITY CARSEAT / INFANT CARRIER RAINCOVER. Bebecar carseat, Norton Carseat and many many more. 1 x Mosquito Baby Net. protect baby from insect, bug etc. Type:Insect Cover.